Nassau Bay Town Square has a brand new retail wing across from the entrance to the Johnson Space Center that soon will be home to several new businesses. Griffin Partners, the developer, hopes to fill one of the spots overlooking NASA Parkway with an upscale restaurant for the community to enjoy. In fact, Griffin is conducting a survey to determine what type of restaurant the community would most enjoy – French, Mexican, Asian, Indian, Seafood, German, perhaps a steakhouse, etc. And, they are inviting you to take your pick or offer a suggestion. The tenants in this new retail section are expected to open late in 2013 or early 2014. The Bay Area community first realized the face of Nassau Bay was about to change in April 2007 when Griffin Partners announced it had purchased 11 buildings on 29 acres around Nassau Bay City Hall –across from the entrance to the Johnson Space Center — from Nassau Development and was planning a $150 million development. Built 40 years before to house NASA and aerospace employees, the aging office buildings along NASA Parkway and Space Park Drive had few tenants and some were completely empty. They would be torn down, along with the city hall building and adjacent city fire station, which moved to a different location, to make way for construction of a new mixed-use development at the intersection of NASA Parkway and Saturn Lane. It would be called Nassau Bay Town Square, Griffin Partners’ Fred Griffin said in making the announcement with then Mayor Don Matter. When completed, he explained, it would be home to office buildings, a four-story, multi-family housing complex, Marriott Hotel, conference center, retail space and the Nassau Bay City Hall. Part of the project included building the city a new city hall. In the meantime, the city offices were moved to 18100 Upper Bay Road. “Our agreement with Griffin is that he’s going to provide us with a city hall that is of the same general character that we have right now,” then City Manager John Kennedy said. By early 2008, the old buildings began coming down and the land was cleared. The housing complex was completed in 2010, and quickly filled up, with the groundbreaking for the retail phase next on the calendar. 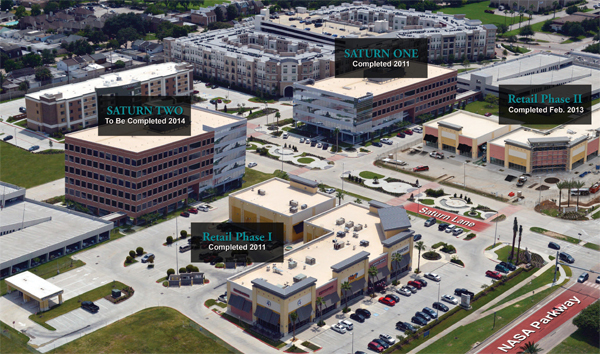 Over the next two years, the first office building went up, quickly followed by the Courtyard by Marriott, and most recently, the just completed second retail section. With that done, Griffin plans to build another office building and replace the Nassau Bay City Hall. Not quite done, but getting there.